One of the (very) few drawbacks of the amazing X3-600 pack is that gear on the bottom of the top loader can be hard to access. Well now CAMP has enabled you to go in through the back door. A secret zippered panel has been installed on the back for more direct access to that important stuff you accidentally packed first. 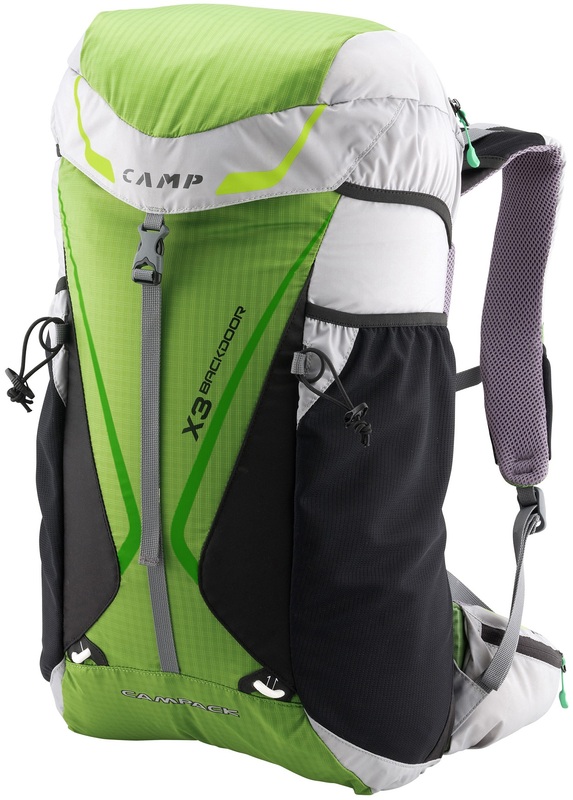 And since the designers were already adding a few grams, they went ahead and used a more durable fabric, making the X3 Backdoor a hard-wearing pack for daily touring. 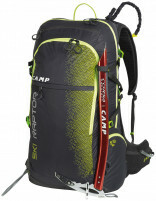 All the other features on the pack are what you’d expect from a CAMP skimo pack. The ski carry system can be used without taking off your pack. Mesh pockets on the sides are great for stashing skins, water bottles, gloves, what have you. 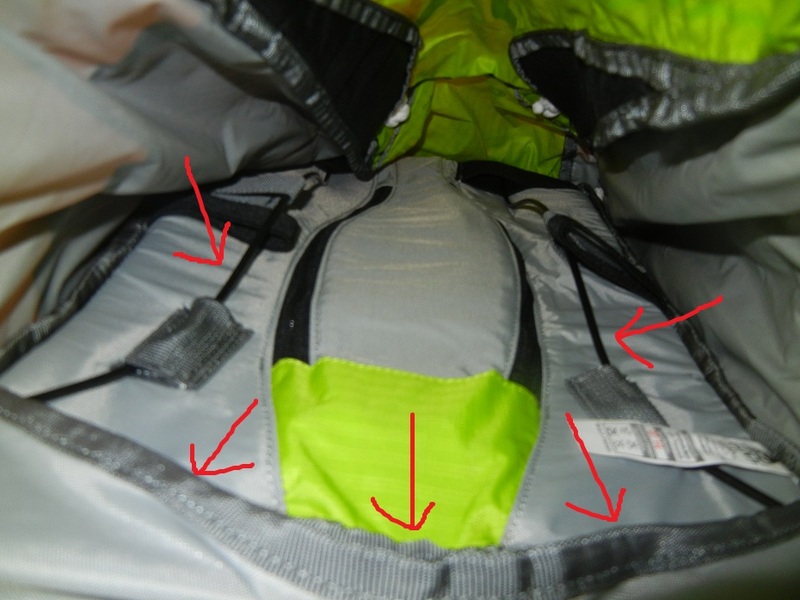 The hip belt pocket holds fuel and ice axe loops carry your pick. This could be the new go-to pack for longer tours when you still want to move fast. New Tri-Ripstop fabric is light, strong, and coated to resist moisture and abrasion. 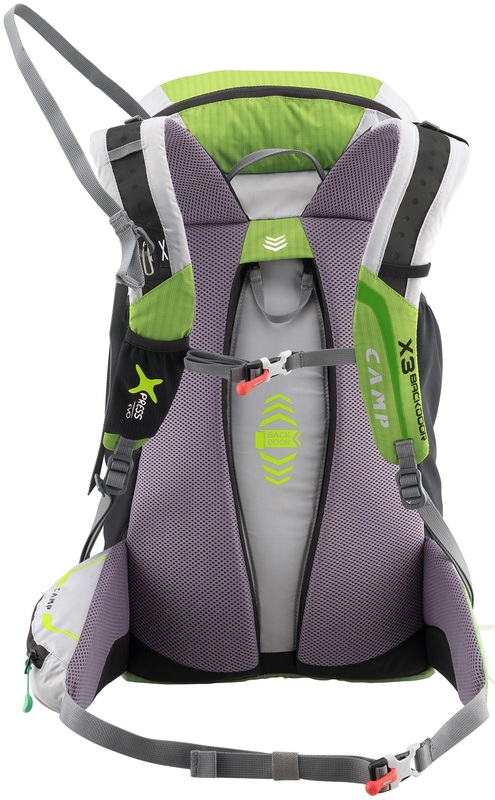 Wire Xpress ski carry system is a loop and sling that can be operated while wearing the pack. Backdoor access panel is opened by pulling a loop attached to zippers, exposing all contents. Hip belt and lower back padding for comfort while air channels in the shoulders keep you cool. EZ OP buckles on the waist belt and chest strap can be opened with gloves on. Dual ice axe loops can be retracted and have simple bungee clips to secure the spikes. Spacious lid compartment and internal security pocket keep you organized. Large mesh side pockets are elastic to hold all kinds of objects or none at all. Hip belt pocket lets you keep fuel, map, compass, clinometer, or camera within reach. thanks for the info! 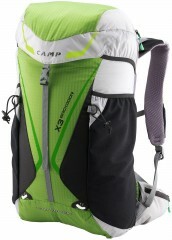 i'm debating this and the camp raptor pack for long spring missions and couloir skiing. the main differences i can tell are the helmet holder and dedicated avy tools pocket... how are the internal restraints on this pack for avy tools? anything else I am missing? any input on which carries skies better on the diagonal/side carry sytem? thanks! Hi Emily, no dedicated pocket, but a couple bands to hole the shovel handle and probe. Not a big difference in terms of carrying skis with the quick carry, I might give the nod to the X3 there. does it have a helmet carry? Hi Emily, there is not a built-in helmet carry system. You could get a helmet inside or possibly use a 3rd party helmet carry. Or better yet, wear your helmet so it protects you! Hi! I love this pack but do not love the non-adjustable chest strap (not really designed for females). Do you have suggestions for a pack very similar to this with an adjustable chest strap? I'm looking for a ~20-30L pack with a quick ski carry system that can accommodate non-race skis (115mm in the tail). Thanks! is the wire ski carry system diagonal or are the skis strapped only to one side of the pack? Im 6'2 sasquatch with a belly made from rice, noodle and brown ale will the pack ski well how is the length on the back panel? Hi Sasqua...I mean John, the skis end up carrying on one side of the pack but slightly diagonal toward the right shoulder. I've skied with it quite a bit and it skis very well, even when loaded relatively full. The waist belt sits a bit high, which may make it seem like the length is a bit short. In practice, it's actually meant to sit a bit higher and the short feeling is something I've become accustomed to. I believe it helps the pack ski better by keeping the weight above and out of the way of my hips. Hey, I was wondering about the frame construction of this pack. What provides structure for this pack? Hi Johnhboy, there is a rigid wire that runs across the top and down each side of the main internal compartment. Here is a picture. It can be removed if you prefer no structure.